Located in the Gongga Mountains in western Sichuan, Hailuo Gou is the biggest glacier park in China. Gongga mountains, at the height of 7556 meters above the sea level, called as "the King of the mountains", is the 11th highest mountains in the world and the highest one in Sichuan Province. In Tibetan the word "Gong" means sovereign and the "Ga" means pure white, therefore the Gongga mountains is regarded as holy and pure mountains by local people. It extends for 30.7 kilometers, and has many geologic features, land forms, rare animals and plants. There are endless ice holes, ice lakes, ice mushrooms, ice doors and ice steps that make up a wonderful ice world. The ice waterfall reaches a height of 1080 meters, and is 1100 meters in width. 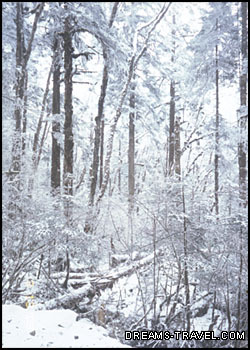 In the primeval forest, there are many rare plants such as the Mongolia of Kang Qing, Chinese gooseberry, Gastonia tubers and the bulb of fritillary. 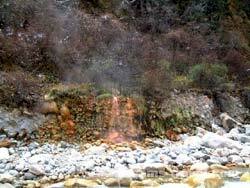 There are also many clear hot springs with good curative effects. 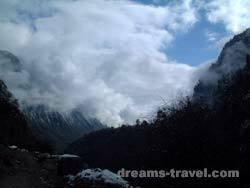 Hailuogou National Glacier Forest Park is an ancient and magic land that is only 280 km southwest from Chengdu. 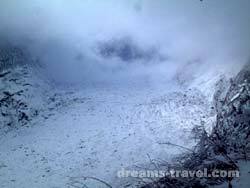 The park is a glacier-eroded valley on the east slope of the highest peaks area of Mt. Gongga, 7556 meters in altitude. It is an alpine barrack of Hengduan Range, which is the edge of Plateau of Tibet. It boasts three characters: it is the lowest altitude glacier in the same altitude glaciers; with high activity, and with the most integrity of glaciered landform. These characters make Hailuogou even better than glacier parks in Alaska of United States and Canada. Hailuogou Glacier, formed 16 million years ago, is one of the natural wonders of the world. When you see this glacial formation, you cannot help but marveled at the elaborated handiwork of nature. 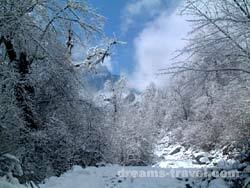 The vast movement of the earth‘s crust caused the Gongga mountains to thrust upward and the moderate climatic circumstances both created the good conditions of the formation of the modern glacier and simultaneously made large amount of sights of glaciers including ice mushrooms, ice pagoda forest, ice stairs, ice grooves ,ice pearl lake and ice crystal etc.